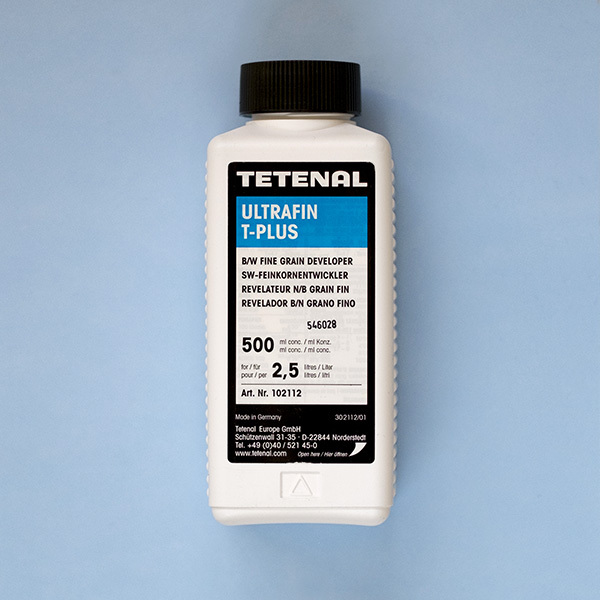 Tetenal Ultrafin T-Plus is a fine grain, black and white film developer. Easy to use, it produces exceptionally fine grain and impressive tone reproduction. Ideal for processing T-Grain films such as Ilford Delta or Kodak T Max. Ultrafin T-Plus has been specially designed to get the most out of these modern films. Additionally, it will also work well with a wide range of black and white films. An economical choice, this bottle will develop up to 30 films. Tetenal Ultrafin T-Plus is also a particularly good developer for push processing film. Unopened Ultrafin T-Plus concentrate will last up to 2 years, once opened it you have 6 months to use it. Fresh working solution will keep for 2 months. Tetenal Ultrafin T-Plus is not a one-shot developer. Simply reuse the working solution until exhausted. You can prepare your working solution in advance, so there is no need to mix up developer each time. Store in a tightly capped bottle until needed for use. This bottle will make 2.5 litres of working solution in total. We recommend mixing it up 1 litre at a time. Tetenal recommends reusing each litre for up to 12 films per litre. As it is a concentrate, you dilute it to make a working solution. To prepare Tetenal Ultrafin T-Plus, dilute 1+4. That means one part developer to four parts water. Once you have prepared the developer, simply reuse until exhausted. 1 litre of working solution will process up to 12 films. Always make sure you mix together thoroughly before use. Have a look at the other Black And White Film Developers we have in stock. Enter your email for updates on things you’ll want to know about.